CharadesWorld.com - The best charades words, ideas and phrases. A fun team game where you guess the words with your friends. We believe that the real fun is when we meet up with friends face to face. 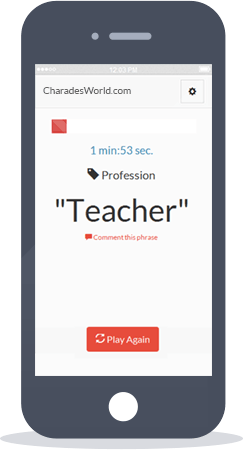 Charades World is a words generator and a timer, thanks to which no other props will be needed to play. Well, except maybe a piece of paper and something to write with (if you decide to guess the words through drawing). Charades are great fun for all kinds of parties: birthdays, halloween, christmas, easter, baby shower and many more! Use your smartphone or tablet. Negligible, some teams work out a system of gestures or symbols that are intended to help in guessing, there is the possibility of showing the individual words, or (in the case of titles of books, movies, etc.) around the phrase by showing the content of the work. ability to communicate through gestures and drawings; erudition and literacy (in the case of titles, proverbs, quotes, etc). Charades is a team game. The main element of the game is guessing the phrases or words. In each round every team guesses a word or phrases, presented by one of the team members. For that reason, it is often required that each squad has at least three contributors. In various stages, the riddles are presented through gestures (pantomime) or drawings (pictionary). Both during the presentation and drawing, the use of words or making any sounds that can help to guess the phrase are not allowed. During drawing it is not permitted to make any gestures or write words; while acting out the phrase, you cannot point at people / places near you. Many charades organisers don’t allow the use of own clothing in order to show the colours. In the database there are currently around 1000 ideas for the game of charades in categories: Idioms, Movies, Professions, Objects and others. We realise that the number of unique phrases in the charades is a key issue. We would be glad if you helped us build a database of exciting charades ideas. If you have an idea for an interesting riddle, you can add it here.